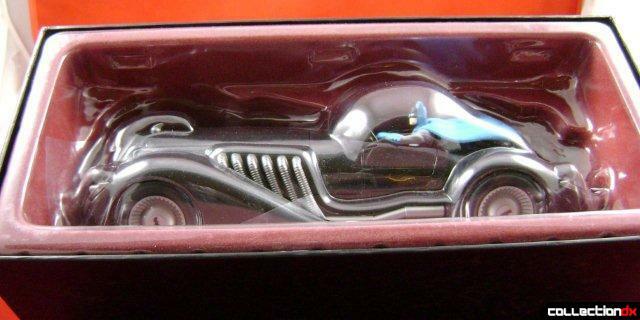 My collection of Batmobiles is missing about 90% of what is out there, but I had an empty slot in a new 1/18 plexi-glass case and it needed to be filled. 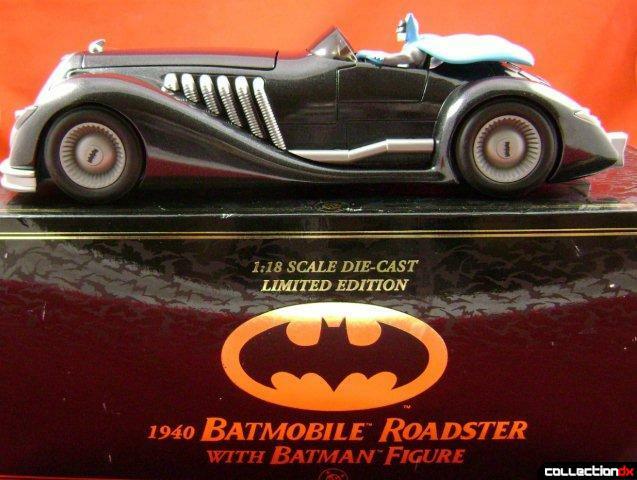 I had owned the Corgi 1940's roadster but sold before I bought the aforementioned case. 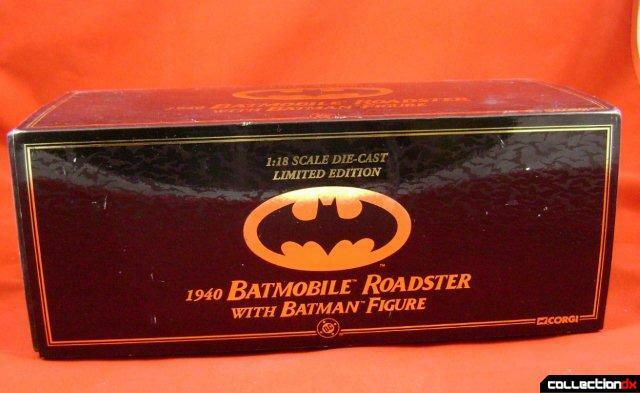 Then one day I saw this baby on EBay and was hooked. 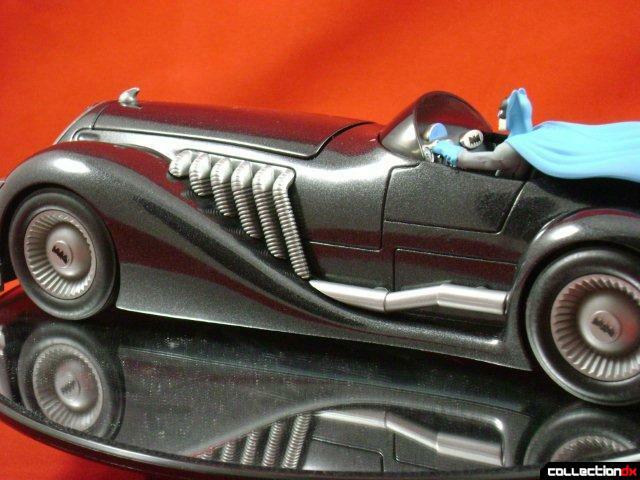 A great start for a Batmobile collection...the first Batmobile...1940's Roadster, but in metallic black (not blue) and with a cool Batman figure. 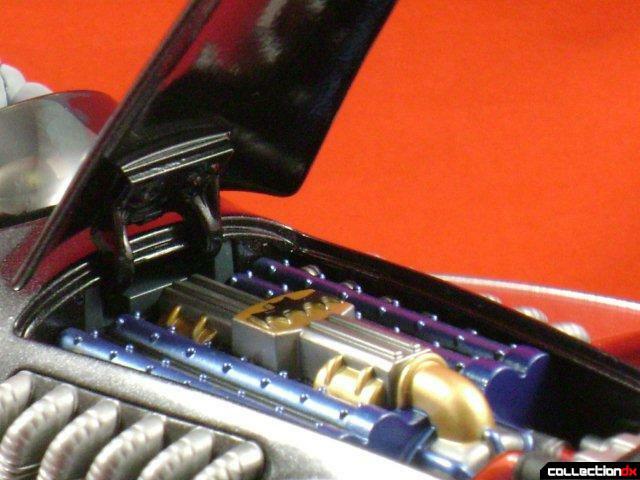 The box is a sleeved black and gold box with a drop-in red felt tray for the roadster. 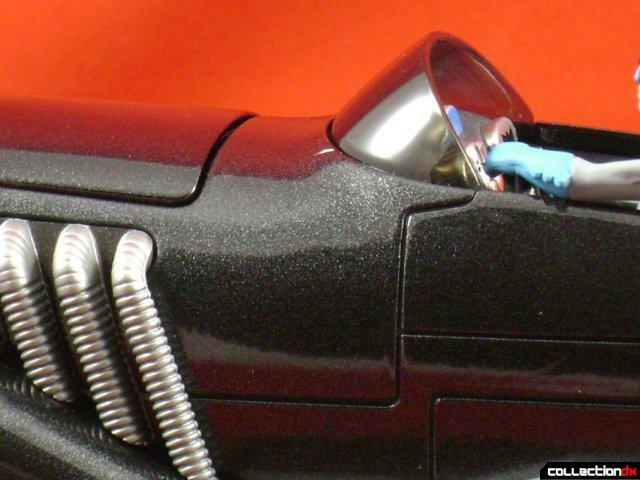 As with all Corgi items, it has quality and detailing. The engine is great. Detailed dashboard (no, the doors don't open but let's stay reasonable). 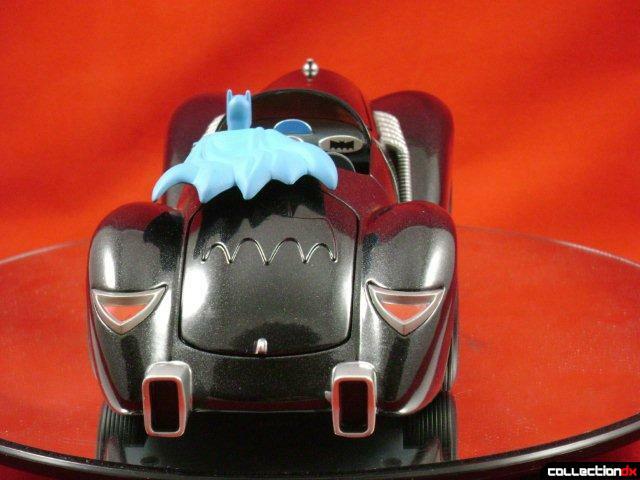 The roadster has great and novel lines that truly help round out my collection. 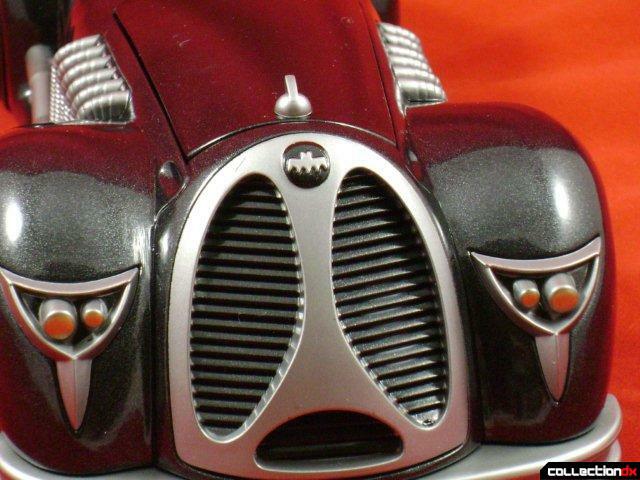 The front grill and back lights have such a nice 40's appeal to them. The metallic paint shines with its silver flake, and even the rims stand out. 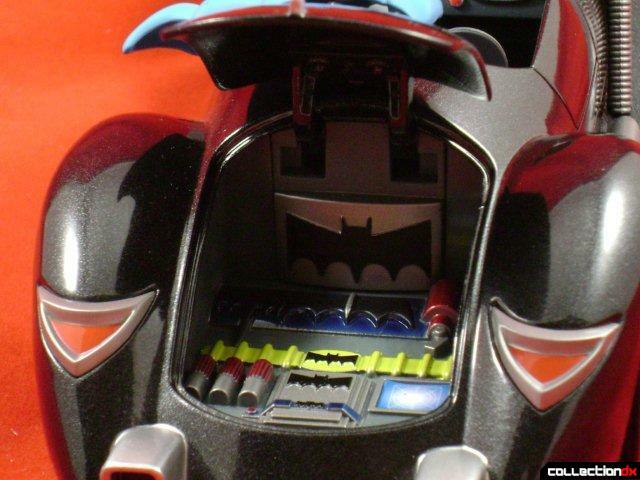 The Batman figure is totally locked in and immobile... yes, a little hokey, but cool. 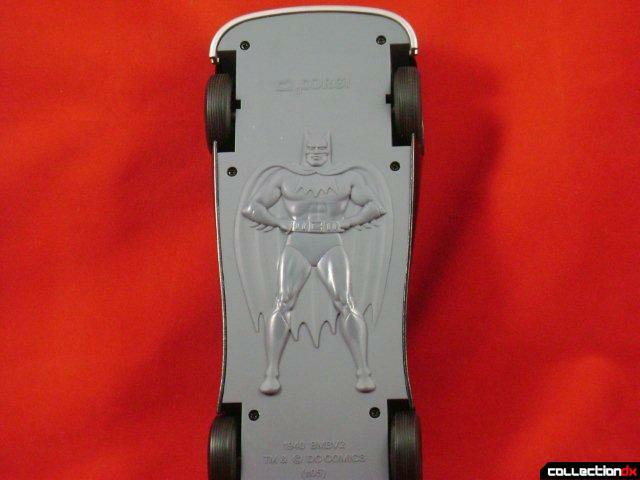 The bottom, as with all Corgi Batmobiles, has the Batman of that time period and company info. Overall it can be had for around 50 dollars if you're lucky, 75 if you're not. 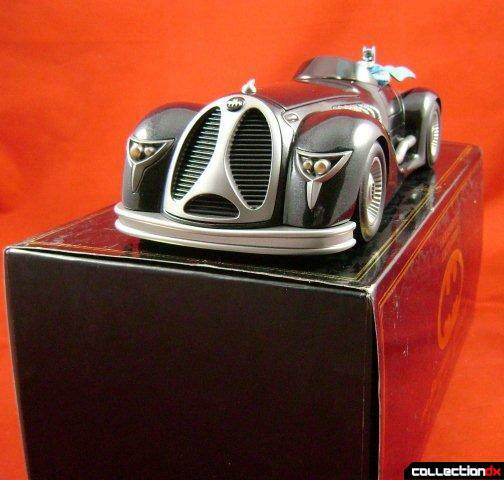 It has a great heft, is diecast goodness, and as stated toward nausea... lines that are sooo darn cool. 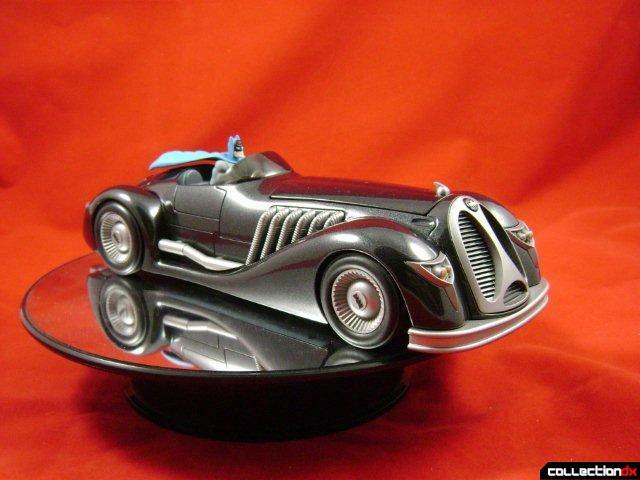 Who needs the Tumbler when you have the Roadster. 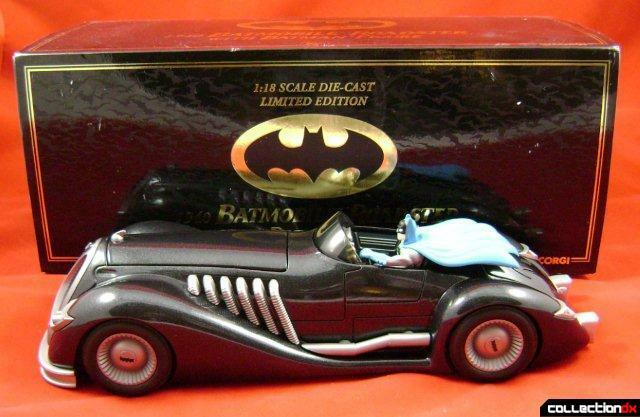 NOTE: There is a 1/43 scale version that looks the same... make sure you look for the black product case, and if you don't like the figure or the black, Corgi released the same car with a blue paint scheme and sans Batman. Geeze! 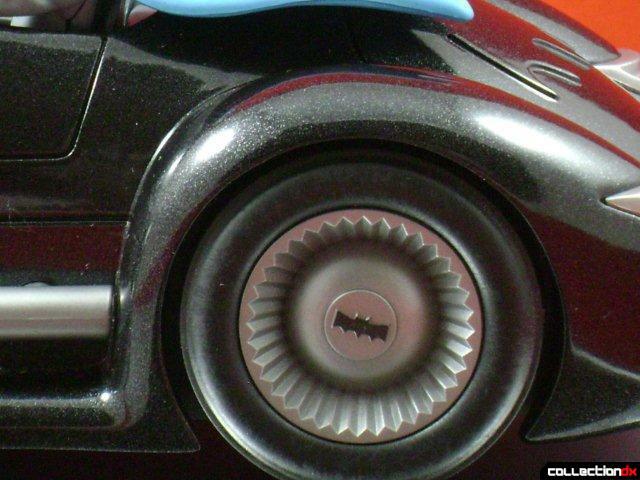 Barely a bat motif on that thing. 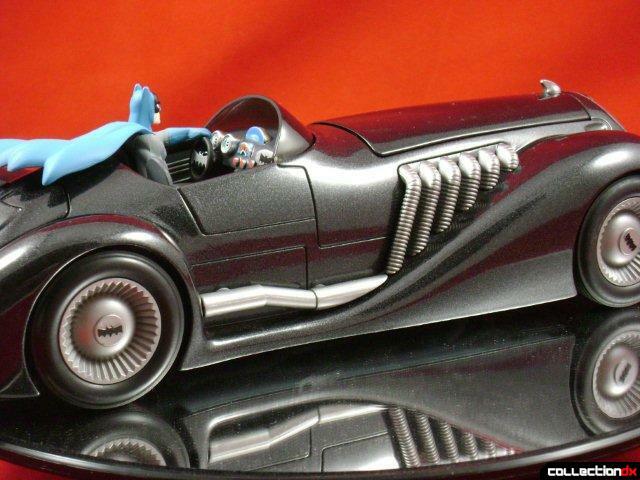 I guess that was during Batman's Straight Pimpin' days. I wouldn't be surprised if he spent most of his time runnin' suckas down with that slick daddy. 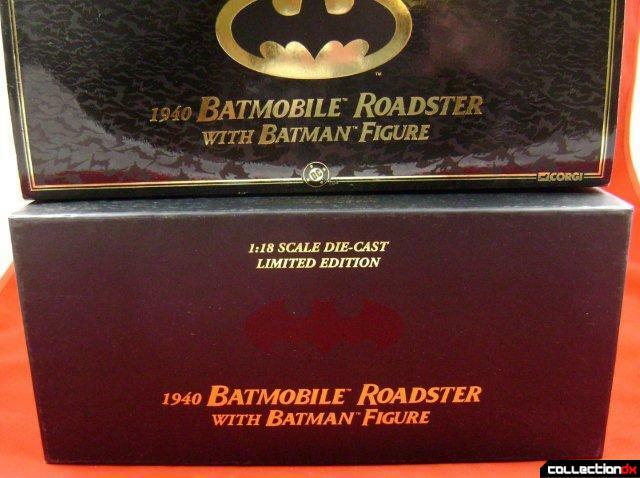 Yeah it's interesting that there isn't more "Batman" stuff in the design but I guess that came later. 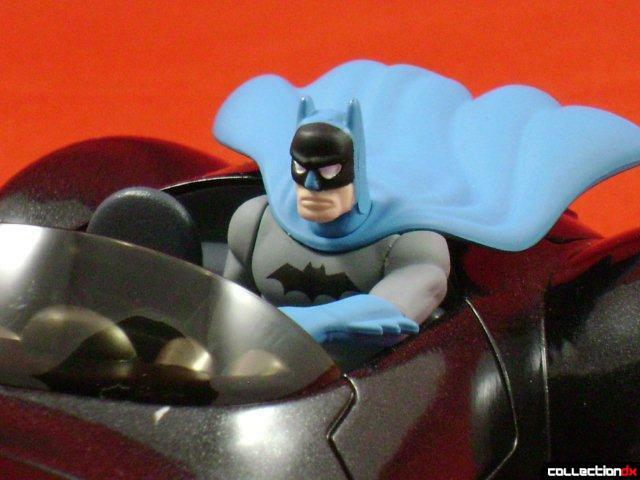 Batman's pose is also interesting. 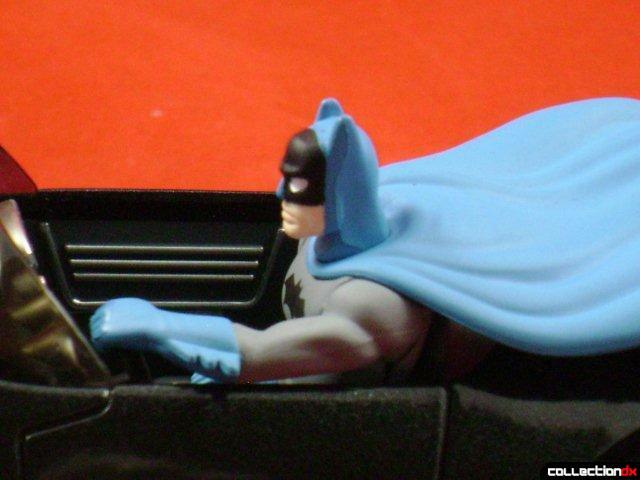 He has one hand on the wheel, his elbow on the door, like he's cruising along the beach. 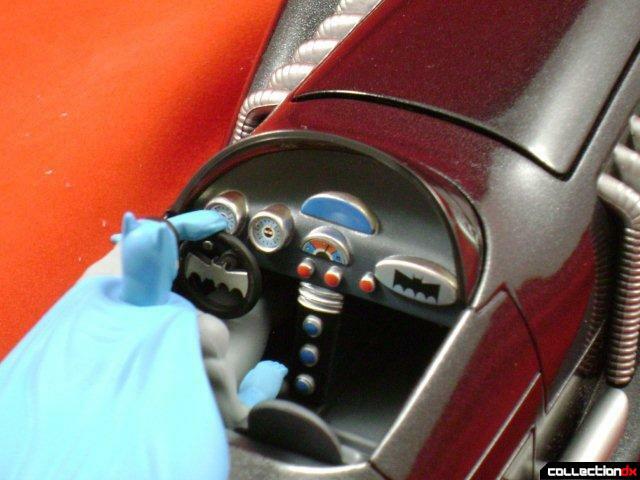 Maybe his other hand is on the stick shift? The cape out the back really gives it a sense of speed. That makes me think that maybe both hands on the wheel might have given it more of a "pursuit/racing" feel? Anyway I love the paint and the mass of the car. Great pics and review. 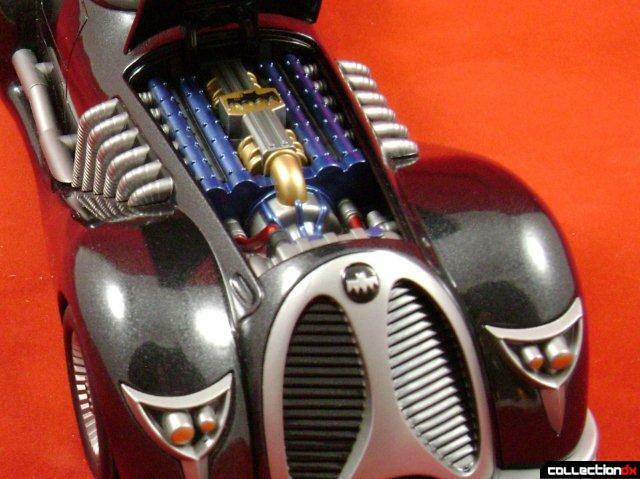 Very cool toy. 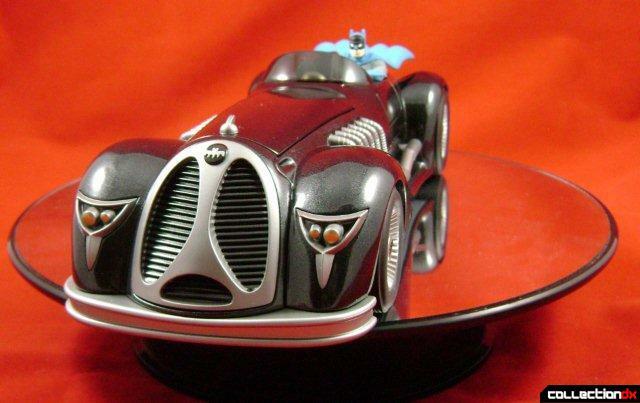 I have it too - but it's not the first Batmobile design. There were others before that, a few if memory serves. 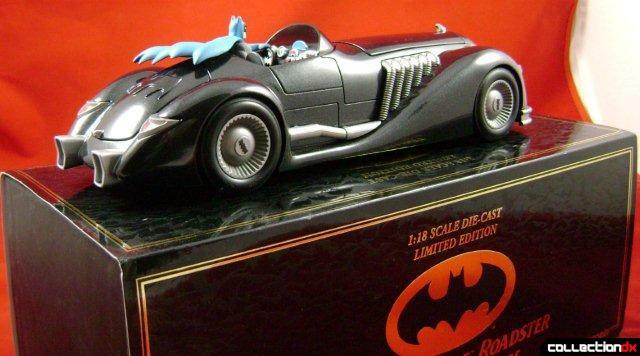 The first one was actually a RED 1939 convertible with no real discernible Bat-characteristics. 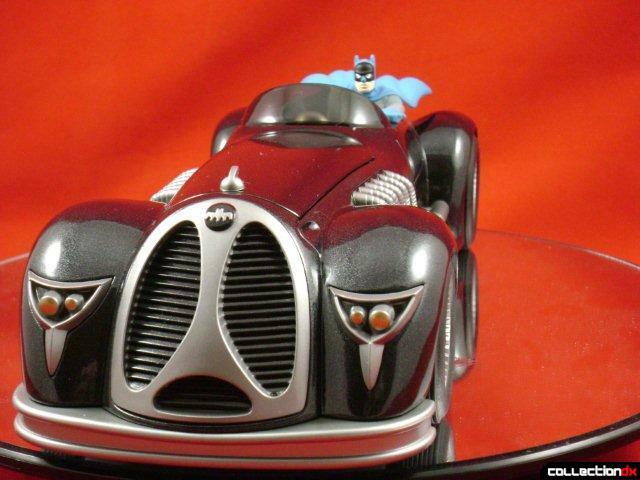 The first Batted-up car was a 1940 coupe, black with red trim, with the BAT-tering ram face on the front and a great big single fin running down the back, and it wasn't actually named 'batmobile' until 1941. Nice details! I can even see where he stocks his extra shark repellent spray cans!